Apple’s new phones support fast charging but it’s a (super awesome) feature hardly anyone has paid attention to. Here’s how to take advantage of it. If you’re one of the people that hasn’t heard a lot about the iPhone’s new fast charge abilities, we won’t hold it against you. Apple apparently saved all their hype energy for the iPhone X and, for the most part, they’ve kind of glossed over how great their new fast charging system is. Here’s the ten second summary. With the advent of the iPhone 8, 8 Plus, and X, the iPhone line now supports Apple’s proprietary fast-charging standard. 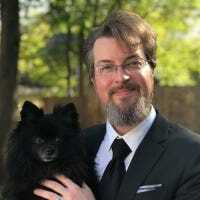 The bigger batteries in the newer phones mean you have to recharge your phone less, but when you do need to recharge it takes a long time to fill the ol’ battery tank back up. Fast charging will lower your recharge time substantially, bringing your iPhone from totally depleted to a 50% charge in a mere 30 minutes—but the included charger isn’t powerful or advanced enough to fast charge so you’ll need additional gear to get that snappy recharge time. You can charge your shiny new iPhone to 50% in 30 minutes, but you’ll need a shiny new charger and cable to go with it. So what do you need to tap into that fast charging goodness? First thing’s first, you’ll need a much more powerful charger than the wimpy 5W one that comes with the iPhone. In fact, not only will you need a more powerful charger, you’ll need a whole new charging platform. 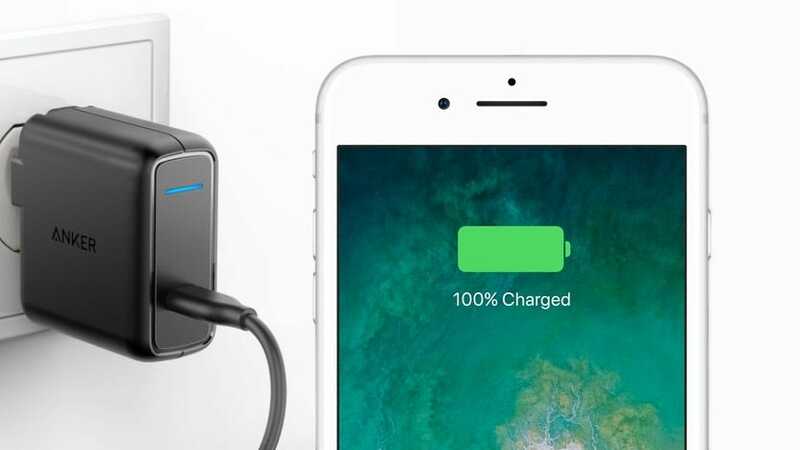 Apple’s fast chargers take advantage of the USB-C standard’s Power Delivery (PD) system to delivery a lot of energy in a safe and controlled fashion to your device. Second, and a natural extension of the first point, you’ll need a USB-C to Lightning charging cable because your regular USB to Lightning cable simply won’t work with the USB-C port on the upgraded charger. The reasons behind why these weren’t included with the new phones, especially the flagship iPhone X, is a mystery best interpreted through the lens of grumpy shareholders, we’re sure. Now that you know what you need, you can just pop over to the Apple Store and buy it, right? Sure, you could—if you want to pay more than you need to. As of now, Apple’s 29W USB-C fast charger is $49 and the official Apple USB-C to Lightning cable is $21, but at $71 as a set they’re neither the most economical or best way to fast charge your device. We tested the official Apple charger and cable against the third-party 30W charger from Anker ($30) (with both the official cable and a third party cable) and were surprised by the results. 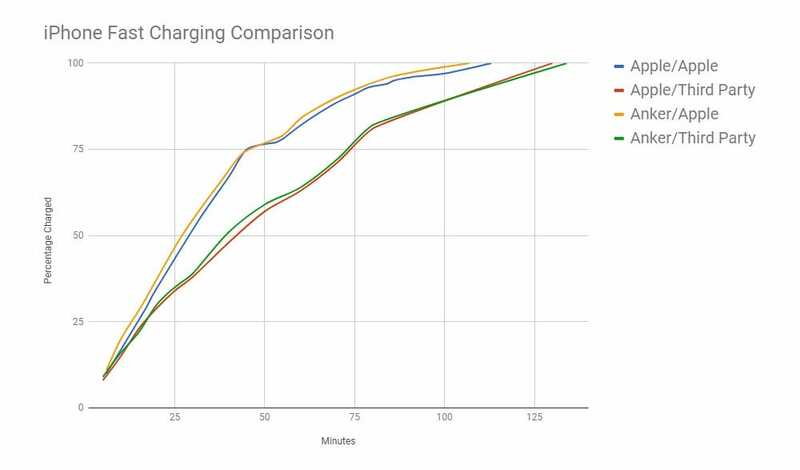 In every one of our tests the Anker charger matched or exceeded the results of the Apple charger (but only when using the official Apple cable, the third party cable dinged the charging speed by around 25%). Although the Anker charger didn’t beat the Apple charger by such an insane margin that we can declare the Apple charger completely inferior, it did consistently outpace the Apple charger by a few percent at every turn and always got the phone to 100% a few minutes ahead of schedule. While we’d prefer to not pay anything extra over the already high price of Apple’s newest phones, if you use your phone as much as we do then we think you’ll find the extra money is well spent. There’s nothing better than quickly topping off your phone’s battery so you never have to roam in search of charging ports when you’re out and about.